‘Brain drain’ — a blessing or a curse? My contribution to The News on Sunday Special Report on the ‘brain drain’ issue last week, in which I write that the urge to “give back” drives many diaspora professionals to help out in the home country in various ways, as well as to play a positive ambassadorial role, asserting an identity that counters stereotypes. However, the conditions that drive educated, qualified Pakistanis abroad are unlikely to change anytime soon. For the foreseeable future, Pakistan’s brain drain will remain a blessing, arising from a curse. Read the full article here, as well as the accompanying pieces by Raza Rumi and others. My article published in The News on Sunday today, about the Contemporary South Asian City Conference in Karachi last month co-sponsored by Harvard South Asia Institute and Aman Foundation, with Pakistan Urban Forum – by all accounts a most dynamic and exciting event. I spoke to two Harvard professors in Cambridge MA after their return from Karachi. Ghari Kheru, Dist. Jacobabad, Aug 19, 2010. A query from Lahore the other day about whether the town of Jacobabad was submerged got me on the phone with friends to inquire. Fortunately, it was just a rumour. But in the process, I got information that had to be used… hence this feature, published in The News today. Jacobabad is famous for being one of the hottest places in the world with temperatures reaching up to 52°C in summer, April-Sept. This year, the unprecedented floods in Pakistan have done nothing to cool things down for this colonial town. 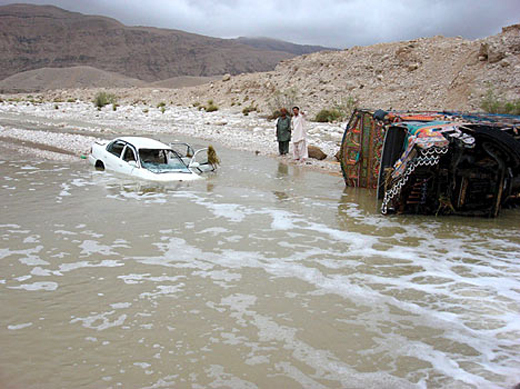 Temperatures in Jacobabad district, on the border of Sindh and Balochistan, remain excruciatingly high despite floodwaters submerging surrounding areas. 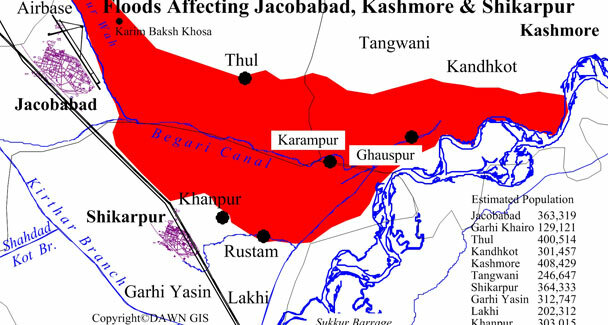 Jacobabad area map showing flooded area in red.